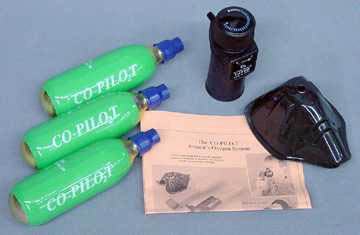 The CO-PILOT oxygen system is a small, light-weight, hand-held oxygen system. 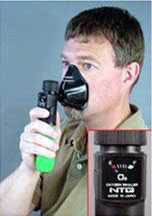 Precision manufactured in Japan, this unit was especially designed for supplemental breathing while at high altitudes. The regulator has an on/off and volume control knob adjustable from off to a max setting of 2-ltr./min. The removable face mask can be replaced by an optional Oxymizer cannula for continuous "hands off" operation. Each 18 liter replacement cylinder lasts up to 30 minutes at 15,000 ft. The regulator can hold a cylinder for several months without any noticeable drop in pressure. Cylinders can be changed by hand. Since this product contains bottles of compressed oxygen, it can be shipped only to customers within the USA and only with UPS Ground shipping (or similar). It is not possible to ship it outside the USA. I try to stock as many parts as possible so I can ship to you immediately upon the receipt of your order. However, MH offers an extremely broad range of products and kits so it is not possible for me to stock everything. However, it is possible for MH to ship parts I don't have in stock directly to you very quickly. That is good for you because you receive the products quickly. It is good for me because it reduces the amount of inventory I need to stock and also eliminates the cost of shipping the products to me. The items marked "In Stock" below are almost always in my stock here in Minnesota, USA. The items marked "1 Day" (or similar) can be shipped directly from the vendor in Oregon, USA to you. Length: 7.875", Diameter of cylinder: 1.5", Maximum width across regulator: 2.5"
Shipping Method: This product contains compressed oxygen. Shipping by air is not available. Shipment outside the USA is not available. Shipping Method: This product contains compressed oxygen. Shipping by air is not available.